InterContinental Hotel Group (IHG) has the most generous Best Rate Guarantee across all hotel brands and can be an easy way to get a free night. IHG offers a Best Rate Guarantee (BRG) that gives you a free night if you find a lower rate on another Online Travel Agency (OTA) website. Basically if you search for the ‘Best Available’ rate on IHG.com, then find the exact room for a better rate including taxes on a different site such as Kayak.com, HotelsCombined.com, Agoda.com, Hotels.com, Venere.com, etc, you can book the room and fill out a Best Rate Guarantee form with IHG to get that night for FREE. Everything across both rates have to match for IHG to honor the BRG claim, but with a little searching and flexibility you can find some great BRG hotel nights for free. It’s never guaranteed that IHG will accept the BRG claim, but it never hurts to try. 1. Go to IHG.com and search a destination using the ‘Best Rate’ search preference. 2. After finding the rate on IHG.com, make a search for the same hotel on a Kayak.com or another travel booking website matching the same dates, rooms, and cancellation policy. 3. If you find a lower rate which matches your reservation all across the board, you can submit a BRG claim with IHG to get 1 free night for the selected room. You must find the same dates, room type (name and bed type) and cancellation policy (non-refundable vs. refundable) with a rate lower by at least $1 or 1% (whichever is greater). The BRG claim must be submitted within 24 hours of the original booking and submitted at least 24 hours before the check-in date. 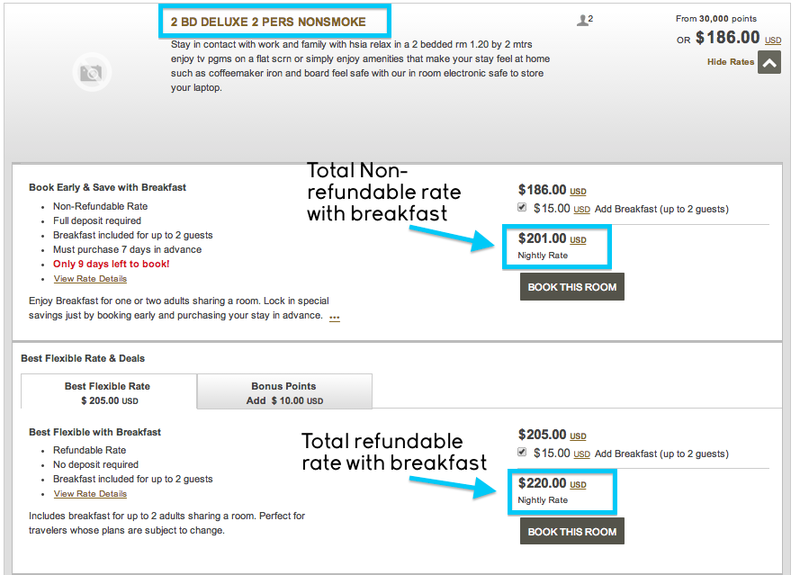 Per IHG’s Best Rate Guarantee policy, you have 24 hours after your original booking on IHG.com to make a claim. The caveat is that IHG does not state in their terms how long it will take for them to respond to a submitted BRG claim. As of late they have had quicker response times, but it could take hours to days—so be patient. IHG is the only hotel program that makes you book the room BEFORE submitting a BRG claim. This means that in all cases possible, you should book a refundable room rate in case you want to cancel the reservation if the BRG is not honored. Of course, this is not always an option so you will have to weigh in the likelihood of your approval chances and whether or not you are willing to pay for the stay if the BRG claim is denied. The most difficult part of finding successful BRG claims is likely having the names match up between IHG.com and the Online Travel Agency website. IHG can be notorious for looking for any reason to not honor your BRG, so for your best chance make sure everything matches up! 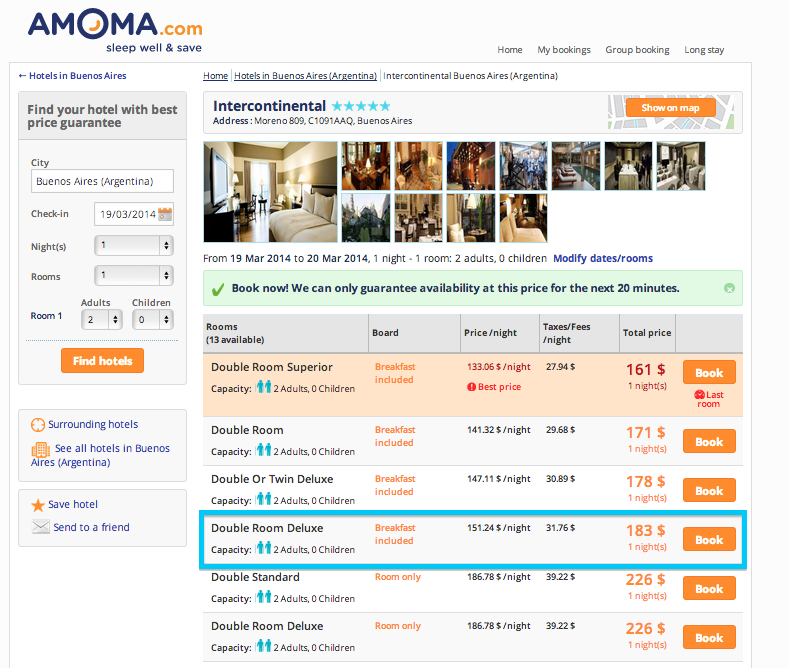 Here’s a potential match at the InterContinental Buenos Aires for a two bed deluxe room with breakfast. Normally this room would go for $201 per night, but if IHG accepts the BRG claim you get one night for free. Was the reservation made through IHG ‘Best Available Rate’ search at one of these properties: InterContinental® Hotels & Resorts, Crowne Plaza® Hotels & Resorts, Holiday Inn® Hotels & Resorts, Holiday Inn Express® Hotels, Hotel Indigo® Hotels, Staybridge Suites® Hotels and Candlewood Suites® Hotels? Did you choose the lowest IHG Best Available Rate? Did you find the same room, for the same nights and same policies for a better rate on a competing site within 24 hours of making the reservation? If you answered ‘yes’ to all three questions, then you can submit a claim. Does that mean your claim will be approved? Maybe. IHG loves to deny claims if there is a slight difference with your reservation and the better rate you found. If everything is the same, then it’s likely you will be approved and you’ll get a free night. There are also reports that if you don’t hear back from IHG within 24 hours of making your claim, your claim will be considered approved. What if the Claim is Denied? If you book a non-refundable room and your BRG claim is denied, then you will have to pay for the reservation out of pocket. For this reason you should book a refundable room so that in case your claim is denied, you won’t be locked into the reservation should you decide to not stay. If you end up finding a match for a different BRG through IHG, you can change your reservation. After you change your reservation, you must resubmit a claim with your updated reservation and the better rate. Remember, the better rate has to be at least $1 or 1% more than the reserved rate. For finding BRG stays my favorite websites are Kayak.com and HotelsCombined.com. Both websites allow you to filter the search results by hotel name and you can easily compare prices of InterContinental Hotels in the search results. After finding a potential BRG you can click through to see if everything matches up. Does the BRG theoretically apply to stays longer than one night? Or can you separately book consecutive nights in a single stay? Mike, the same guest is only allowed 1 free night within 7 nights at the same property. If you book a stay longer than 1 night you will get the first night free and the subsequent nights at the lower rate you found.